The supermassive black hole at the center of our galaxy is about to get its close-up, and it could ramp up our understanding of the universe. A gigantic black hole could unlock the very secrets of our universe, and scientists are trying to get a better peak at it to see what they can learn. It’s the first ever attempt to try to image the event horizon of the massive black hole known as “Sagittarius A” that sits at the center of the Milky Way. Known as the “Event Horizon Telescope,” it is a network of observatories that will observe the black hole starting earlier this month and ending April 14. Sagittarius A has never been imaged directly, and scientists have only been able to observe the effect of the stars that encircle it, so this will be a big test of scientists’ ability, and ultimately on the theory of gravity itself once they are able to observe it. 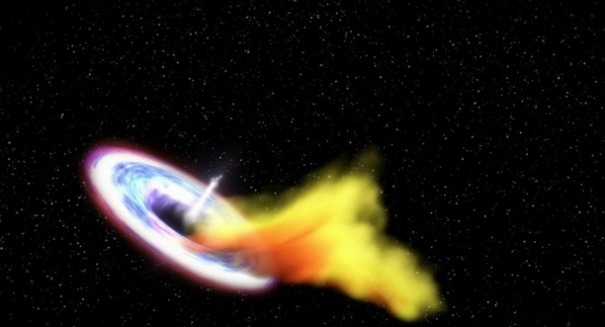 The black hole is situated 26,000 light years from Earth, and is about 20 million kilometers wide. It is the closest known black hole to us, so it’s the best to observe. The telescope works by linking radio receivers together to gather data to observe the event horizon, which is the boundary past which nothing escapes, not even light. “Realizing this goal would open a new window on the study of general relativity in the strong field regime, accretion and outflow processes at the edge of a black hole, the existence of an event horizon, and fundamental black hole physics,” states the Event Horizon Telescope website. “Steady long-term progress on improving the capability of Very Long Baseline Interferometry (VLBI) at short wavelengths has now made it extremely likely that this goal will be achieved within the next decade.